It doesn't seem the sanctions slap on the wrist Obama put on Russia has gotten their attention. U.S. officials are refusing to call Russia’s ongoing invasion of Ukraine this week an invasion, and the issue is not on the agenda for Thursday’s National Security Council meeting. The meeting will include heads of intelligence agencies, Secretary of Defense Chuck Hagel, Vice President Joe Biden, and Secretary of State John Kerry, the three of whom plan to join remotely. The meeting is expected to include discussion of whether or not the U.S. will carry out strikes against the Islamist terrorist organization ISIS inside Syria. Russian combat troops are currently inside southeastern Ukraine. NATO released satellite imagery showing this on Thursday. 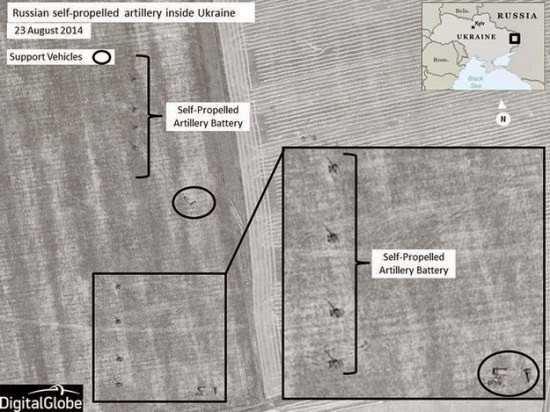 “The satellite images released today provide additional evidence that Russian combat soldiers, equipped with sophisticated heavy weaponry, are operating inside Ukraine’s sovereign territory,” NATO Brigadier General Nico Tak said.